In the summer of 2015 we spent a couple of weeks in Iceland, with the opportunity to do some backpacking while we were there. 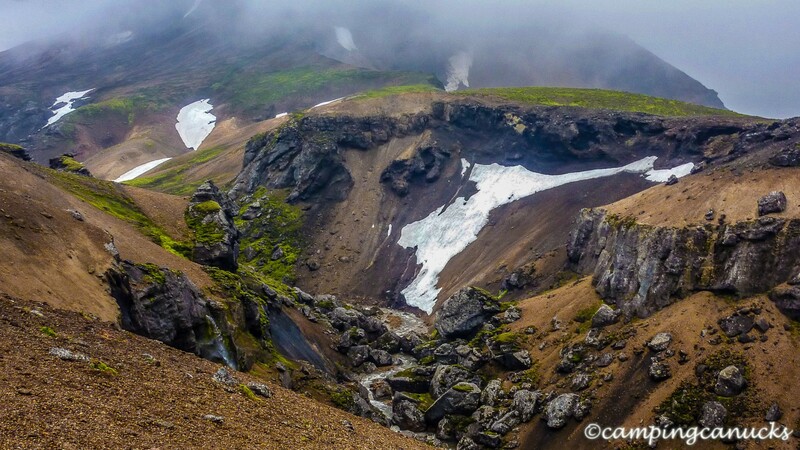 With that in mind, we decided to do Iceland’s famous Laugavegurinn during the last week of our trip. 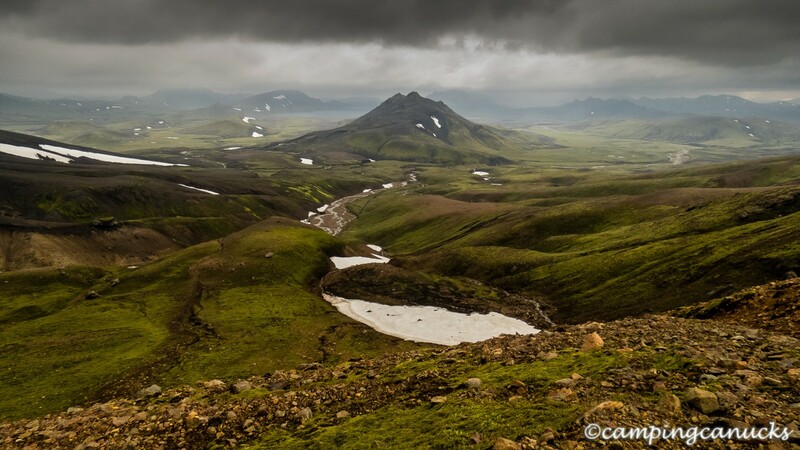 Originally we had intended to spend four days and three nights but we changed the trip to three days and two nights due to poor weather and the chance to have more time in Reykjavik after getting off the trail. We had also considered staying in the huts along the way but in the end decided that we would bring our tent along for camping on the trail. Most people who travel to this trail will take the bus, but we were lucky enough that our friend Sigurður offered us a ride instead. It was a lot more fun making the trip in a car with someone who knew the area and was able to point out things to us than the four hour bus ride would have been. For much of the drive, it was along Iceland’s somewhat infamous F roads but the ones we were travelling on were not too bad and would have been passable by most cars. 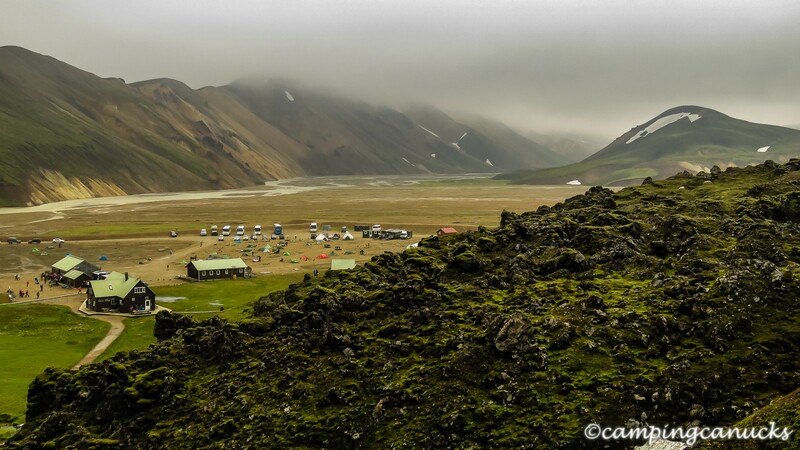 However, in order to actually reach the trailhead at Landmannalaugar, you need to cross two rivers just before the campsite either by driving or on foot. If you do take the bus, it’s capable of crossing the rivers. We were also to get across easily enough although I walked across each time just to make sure the car could in fact do it and that the water was not too deep. The first thing that struck us upon arriving was the wind, as Landmannalaugar is in the middle of a plain with nothing in the way of cover. The many tents being held down by numerous rocks were a testament to just how windy it gets in the area. There were a fair number of people and vehicles at the site but it did not seem all that crowded for a mid-August day. After a short bit of time to gear up, we swung by the tourist office to see if registration was necessary or not before hitting the trail. The guy gave me the once over, asked if I knew how to navigate since it was a complete whiteout in the mountains, noted I was wearing rain gear, and said “Have a nice trip”. That was it. Casual for sure which is probably why so many people get lost on the trail each year. It wouldn’t be long before we understood how easy it would be to get lost in those mountains and why people have died up there. A short climb later, we were looking down on Landmannalaugar and the plains as we made our way into the mountains. We didn’t linger here very long as we knew we had a long day ahead of us, as we needed to reach the second camp on the route before dark, and it was already noon when we hit the trail. The nice thing about Iceland, though, is that in the summer the sun sets very late, so we knew we had many hours of daylight ahead to make the 24km that we needed to reach camp. The first couple of kilometers were unlike anything we had hiked in before. The ground was a combination of volcanic rocks and fine ash, interspersed with grass and moss. But there was not a tree to be seen which really lends it to feeling quite barren. The smell of sulphur permeated the air much of the time here from the many hot springs that were around. 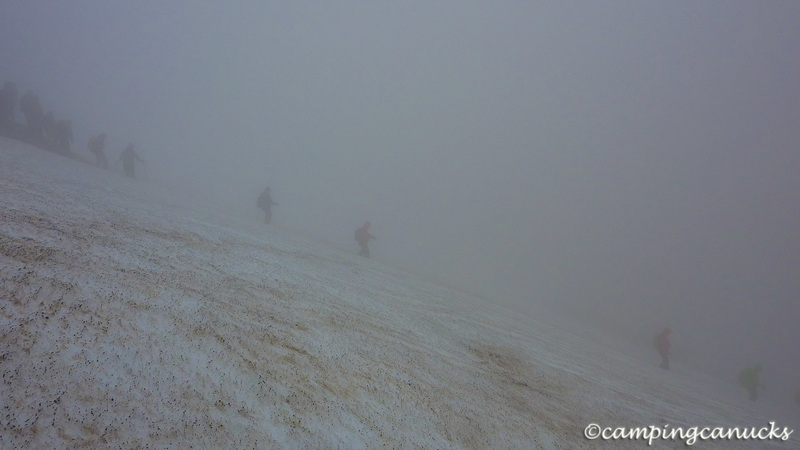 It wasn’t too long before we found ourselves moving into the fog and began to find the trail was getting hard to follow at times. With visibility dropping to zero, we began to find ourselves wandering off the trail more and more often, particularly when we were on the snow. 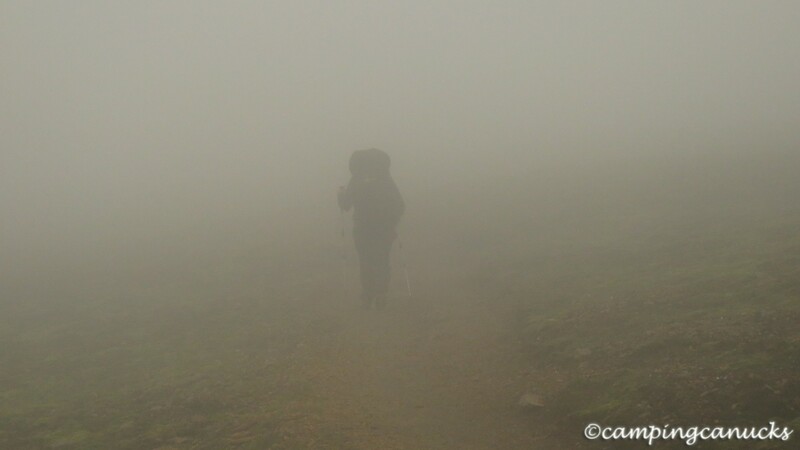 This is supposed to be one of the most scenic trails in Iceland but on this day, it was completely whited out and we could not see anything beyond a few meters. We were happy that we had found maps to put on our GPS units as for most of the next few hours, we navigated completely by our GPS. Periodically other groups of people would emerge from the white, heads down to protect from the wind. This was one very windy section of trail and we found at times we had to stop and rest on our poles to keep from getting blown over. Or at least it felt that way to us. 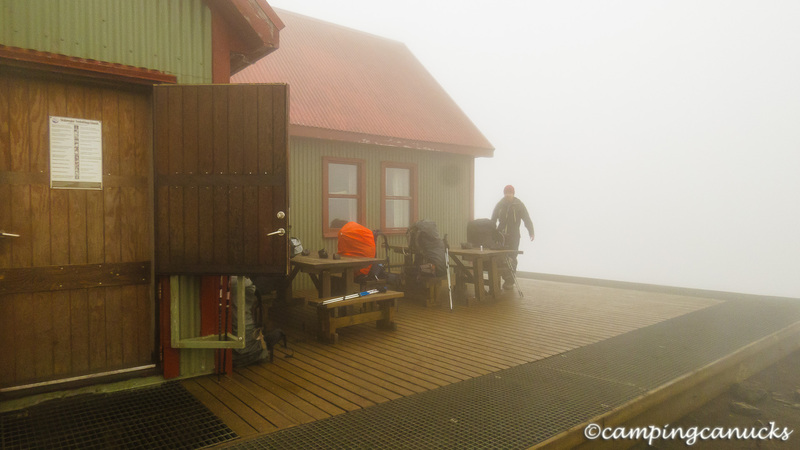 After hours of fog, we finally reached the first huts at Hrafntinnusker, where we took a short break and the chance to take a look inside at the hut. It was nice and seemed welcoming but being as foggy as it was, we were glad we were not staying at this camp. And much of the camp was still under snow due to a record snowfall last season. In fact, we saw no tents at all in this dreary place where the wind blew so hard. We met a few people in the hut and heard stories of the various groups that had gotten lost in the fog until finding someone to lead them out. One such group of South Americans we encountered had been wandering around lost for hours until luckily they chanced upon an English guy with a GPS who had led them to the hut. With heavy hearts we loaded back up and continued on down the trail with the disappointment of knowing that we were walking through one of the most scenic areas of Iceland and were unable to actually see any of it. The next part trail was a bit hard going as we crossed a lot of snow and went up and down ravines and gullies. But as the saying goes, ‘you pays your money and you takes your chances’. The good thing, though, was that there was nothing in the way of forest or brush to impede our way; it was all ash, rock or snow. Many times we would be following a trail in the dirt, only to find that we would lose it once we reached another snow pack. And much of the time, the tracks we would follow through the snow would themselves be going in the wrong direction and we would have to take a bearing to find our way back to the real trail. It was good navigation practice. Steadily losing elevation as we progressed, we did eventually notice the fog was thinning as we were finding ourselves coming back down from the cloud cover. A little further along, we came to one of the most stunning views along the trail as we approached the valley where the hut at Álftavatn was located. 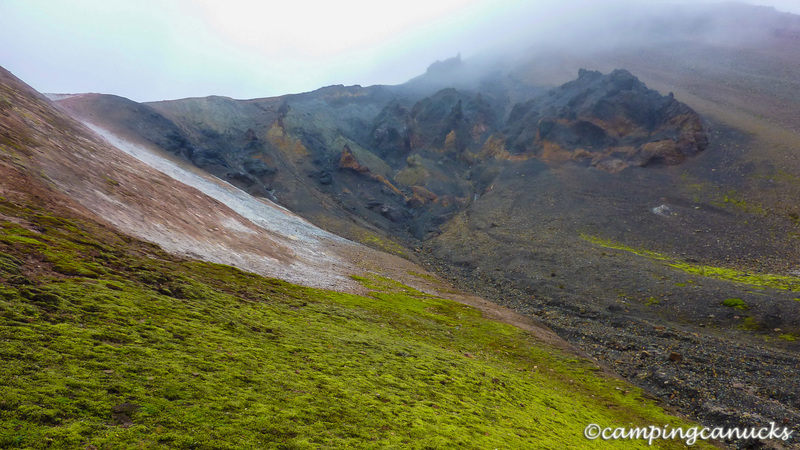 While it was still quite cloudy, we had great visibility and were surrounded by the lush volcanic plains broken up by old cones and flowing rivers. We weaved our way down into the valley and found that our spirits were greatly revived by being out of the fog. And we could now see other people on the trail in front and behind us. This is also where we reached our first river crossing. One of the notable things about the Laugavegurinn are the river crossings. Most of the rivers do not have a bridge which means hikers have to wade across in water that can be more than a meter deep, not to mention cold, and at certain times of year are very fast flowing. Being that it was August, we were hoping the water would not be too high late in the season. Regardless, we had brought sandals along so each river crossing meant stopping, removing boots, rolling up pants (or not), and then crossing in sandals. Once on the other side, we would dry our feet, put the boots back on, and continue on our way. It was actually quite refreshing much of the time, as slow going as it was. 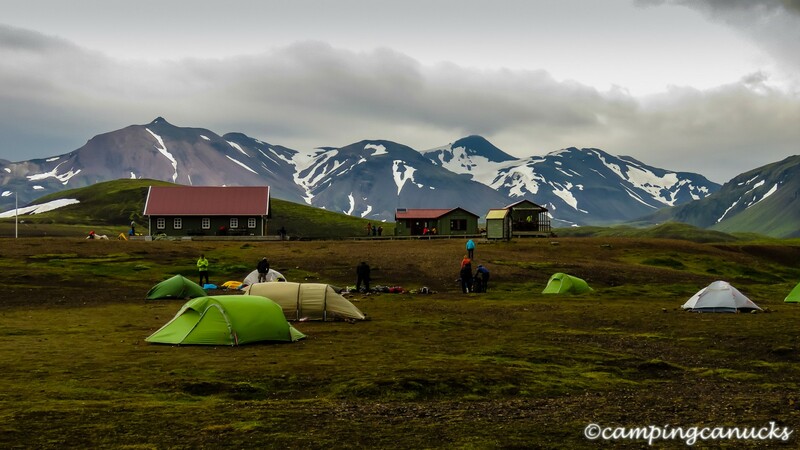 Shortly after the river crossing, we reached the hut at Álftavatn where we would be camping for the night. Little did we know we were going to be in for an exciting and somewhat sleepless night at this camp.